That’s what I felt reminded of at a recent conference on “science and education in the 21st century” [couldn’t have been broader, or? ], in the Siberian regional capital of Yakutsk. I found most interesting to be part of the Russian hospitality and performance system. 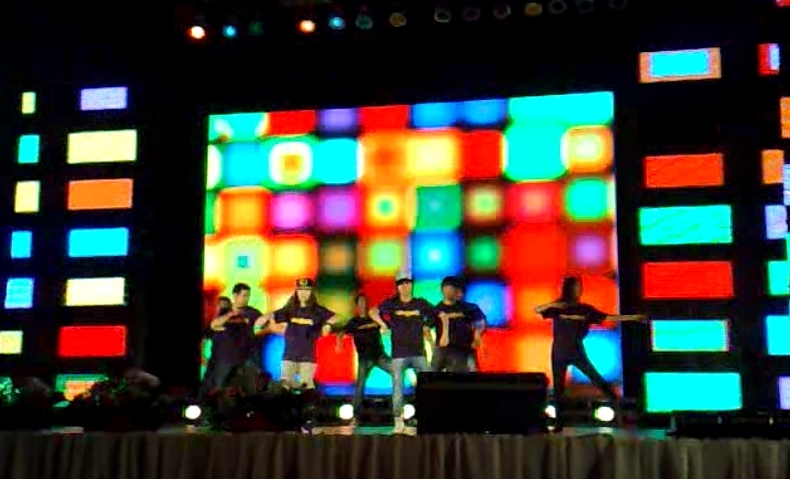 The opening was in a sort of stadium hall with more than 2000 people present. 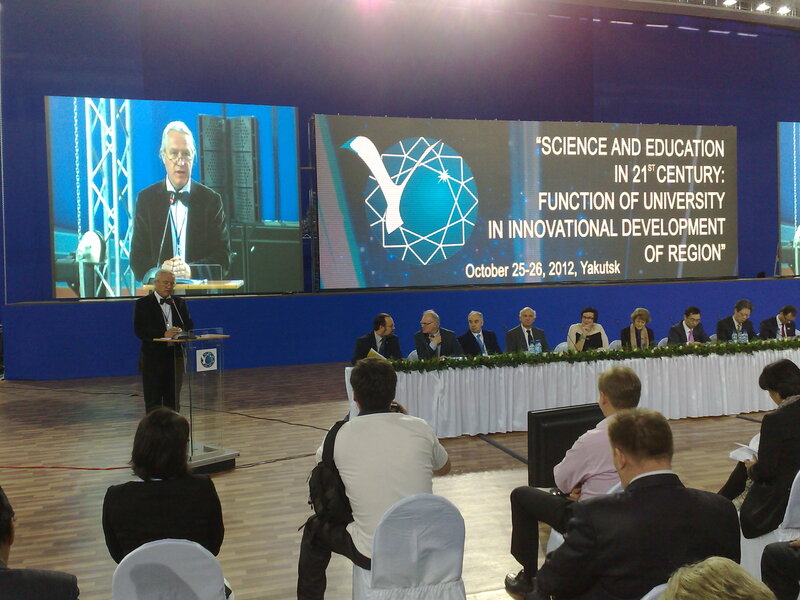 Rector Mikhailova had summoned all her staff at the University to attend this. As one colleague told with a slight smile: dobrovol’no-prinuditel’noe uchastie, meaning voluntarily-induced participation. Impressive how disciplined all these people turned up. I feel almost envious, because this would hardly be possible here in Europe at this scale, and when we want many people at our events we don’t have that efficient instruments at hand to make them turn up. We were greeted by neo-traditional Sakha/Yakut dance that resembled some re-incarnated indigenous actors from a science-fiction film. All the foreign and honorary guests were seated just in front of the stage on seats covered with white fabric, and we looked on three huge screens just behind the conference presidial committee. Introducing the latter, the rector greeted, among others, the IASSA president Mister Gail Fondahl, and was positively surprised when Gail turned out to be a woman (:), surely we also don’t always know if surnames are for men or women), and rector Mauri Ylä-Kotola from our University of Lapland, who due to a translation delay and unusual pronounciation of his name by the rector did not notice when it was his turn to wave his hand in this ceremony to 2000 fans. Each speaker was filmed close-up and directly visible on the screens and audible everywhere through huge loudspeakers. Gone are the times were you went to the Russian north and were sitting in crappy provisionary wooden buildings at conferences where paper was scarce, copy machines were not working, the audience were old Soviet intelligencia all in grey suits, and for dinner you got dry buckwheat and marinated vegetables from last years harvest. Now we were accomodated in a posh Canadian style hotel with own swimming pool and luxury en-suit rooms, fed with fresh melons, grapes and pears in the coldest metropolitan city on earth. – it came completely unexpected, and that he lost his heart to Yakutsk during his first ever travel as Uarctic President – to the then called Yakut State University. The ceremonial dressing of the doctoral hat and gown accompanied by pompous music fitted perfectly to the staged hospitality performance that we were part of over the previous two days. 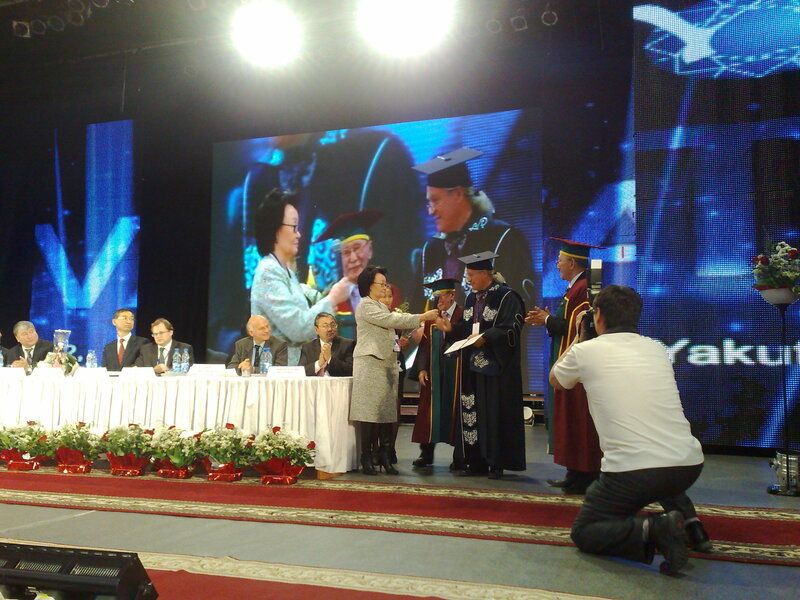 During that ceremony, all kinds of “agreements of eternal love and friendship”, as Piers Vitebsky called it, were signed between Yakutsk and partner Universities from abroad. Piers acted perfectly in this ceremony, by bringing along the official round stamp of the Scott Polar Research Institute of the University of Cambridge, which he stamped on all copies of the contract with an elegant swing of his right hand. Wonderfully amusing! The ceremony was followed by a hugely loud concert with performances of all sorts from neo-indigenous dancing to Russian patriotic war songs all the way to student rap. All this was a truly impressive experience, and demonstration of the might of an Arctic University that has the ambition to become number one in the Russian North East, and if possible to the world’s top 100, as the rector solemnly announced. Reading the University newspaper in the morning, the figures look as if there is still some way to go: in terms of publications NEFU ranks almost last among all Russian Federal Universities. Partnerships with foreign colleagues should get them over that problem. But I guess the performance would also improve if they could cut down the teaching load of their staff and start investing some of their money in their human capital through proper salary for teaching AND research. In terms of using hospitality to your guests to boost your own reputation, I felt reminded of a potlach ceremony, a competitive gift-giving and hosting event where the more you flood your hosts with great generosity publicly, the higher your reputation, and the higher the expectation to anybody else to return such hospitality with even greater generosity during the next event. In extreme cases, potlach feasts developed not only to the distribution of wealth to guests (its main purpose according to anthropologists), but also the destruction of wealth. In a way, that is also what we saw when we think how much resources the University there burnt to host us. But at least it’s a useful burning of wealth, because it definitely raised the fame of NEFU among many, and productive international partnerships is what they need in order to come high in the next Federal University assessment by the Putin administration. Thanks to them for having been part of this. This entry was posted in All, conferences, Guests, Russian North, Theoretical Issues. Bookmark the permalink.